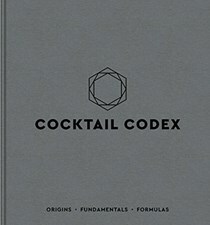 Cocktail Codex: Origins, Fundamentals, Formulas by Alex Day, David Kaplan and Nick Fauchald, authors of the best-selling and genre-defining cocktail book Death & Co, is a comprehensive primer on the craft of mixing drinks that employs the authors' unique "cocktail families" approach to give drink-makers of every level the tools to understand, execute, and improvise both classic and original cocktails. what sorts of drinks you should turn to or invent if you want to try something new. explicit instructions dedicated to each minute detail such as "how to shake with 1-inch ice cubes"
helpful guides such as "common citrus fruits and their cocktail applications"
I am so mesmerized by this book that I have the Death & Co. original cookbook on my wish list. I'm told that the debut title is more complicated with many sub-recipes but the photography looks stunning. If it is half as beautiful as this book, I will be pleased (or should I say I will drink to that?). I've decided it's time to go on a liquid diet. Bottoms up. Special thanks to Ten Speed Press for sharing the materials needed for our EYBD Preview and for providing one copy of this book in our giveaway below. The publisher is offering one copy of this book to EYB Members in the US & Canada. One of the entry options is to answer the following question in the comments section of this blog post. Please note that you must be logged into the Rafflecopter contest before posting or your entry won't be counted. For more information on this process, please see our step-by-step help post and this forum post. Once you log in and enter your member name you will be directed to the next entry option - the blog comment. After that, there are additional options that you can complete for more entries. Be sure to check your spam filters to receive our email notifications. Prizes can take up to 6 weeks to arrive from the publishers. If you are not already a Member, you can join at no cost. The contest ends at midnight on May 13th, 2019. That Snowbird sounds good to me! Ti' punch, a favorite ! Mint julep, I love the idea of bourbon and mint together. I have so much fresh mint and I don't enjoy the rum in a mojito. The Heat miser sounds so interesting! Beach Bonfire! We have pineapple gum syrup and would love a recipe to finally use it! Snowbird. We live in Florida and usually have a welcome back party for our “snowbirds” in the fall. This would be fun. Mint julep, Ky girl here! Definitely the autumn old fashioned! Since I'm a beekeeper, I think I would try the bees knees. I might take the lemon out and substitute pomegranate syrup.